Beyoncé, I was here ??? Can someone explain me why I am seeing Beyoncé singing on top of poor african needing our help or somewhere in between the stars ? Why do I am stuck in a strange dream somewhere in between a scene from the 5th Element and a clip of Michael Jackson ? I understand that tomorrow is the World Humanitarian day, and I understand that as ridiculous as it seems it is better to do something that nothing. I also understand that Beyoncé, as a pop icon would want to get involved in support the existance of this day. So far we are all together almost holding hand. But here is where it gets out of hand… What the What is this video ? 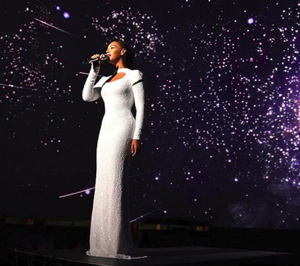 Since no one bought the feminism touch of Beyoncé, she decided to play Greek Godess, singing somewhere big enough for her ego: Space. I still can’t believe it. And I though we where over in filming ppor children, people in need over pop. Please let me wake up from this vulgar dream with people applauding. Please let me wake up !! !